With the huge success of the MiG-21F interceptor, it was realized that a dedicated trainer was needed to transition pilots from the more sedate MiG-17 to the much faster and more difficult to handle MiG-21. Its high landing speed was something that was the major cause for concern as once in the air, the aircraft flew beautifully. 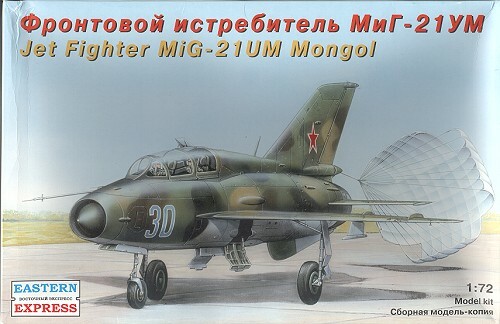 Based on the MiG-21F-13, the MiG-21 UM was basically the same except for two major areas. One was the addition of a second cockpit for the instructor. This resulted in a loss of fuel capacity so a large spine section was added to help return some of the MiG-21's limited on-board fuel. The other major change was to a broader fin as was seen on later variants. A bulge in the fuselage side was to allow the use of larger wheels and tires. The wings were able to handle two pylons as in later MiG-21 variants, and were often used to hold fuel tanks. Though the gun was removed from the trainer, it was able to carry air to air missiles. 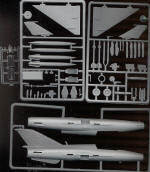 It is difficult to review a 1/72 MiG-21 without comparing it to what has come before. 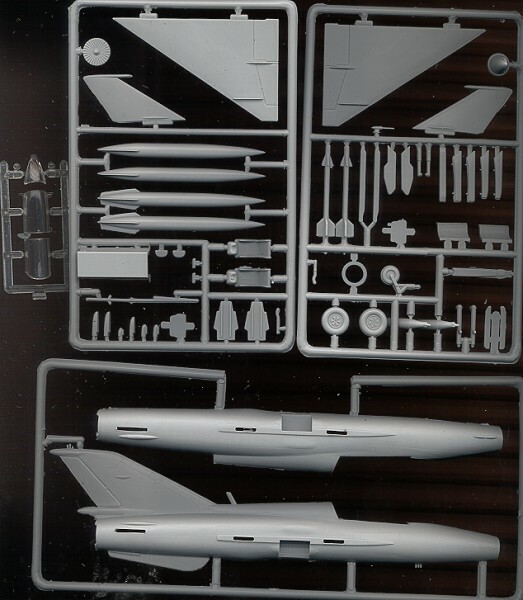 In this case, the comparison is with what most consider the best 1/72 MiG-21 kit on the market, the one by Fujimi, and the still nice, but older KP kit. I can confidently tell you that this one is closer to the Fujimi kit than it is the KP version. The grey plastic is nicely engraved, though perhaps a bit lightly for some builders as I can see this easily disappearing under any sanding. The sprue attachment points are generally rather large so care is needed when removing parts. I also found that most parts had some level of flash or at least thick mold seams that will need removed. The cockpit consists of a pair of somewhat generic looking seats with belts faintly molded on them. I'd suggest replacing these with some resin bits. There are also two control sticks and two instrument panels. There is no detail on the panels or side consoles, this being represented by decals. Moving to the fuselage, all the various scoops are separate parts that will need to be added to engraved areas on the fuselage. There are two drop tanks and two missiles provided. The missiles are rather generic looking and would really benefit from replacement. Two even worse looking rocket pods are also provided. Four wing pylons and a centerline pylon are part of the suite as is a gun pod, which I don't believe is used on this variant. The front gear has the wheel/tire molded as one part. The main gear legs are really devoid of any detail at all, though the wheels and wheel wells have some. The clear bits are fairly well molded though they have flash. They are a bit distorted and have some mold flaws. I'd say that the windscreen is too pointed, though you'll probably not be able to find a decent replacement. The instructions are fairly well done and well drawn. There is no color information provided at all so you are on your own in terms of interior and wheel well colors. The instructions show main gear retraction struts, though none are provided. Nose weight is needed to prevent tail sitting. Markings are provided for three aircraft though only one is shown anywhere in the kit or instructions; that being the Russian version. Oddly, the sheet is for Red 142 while the instructions show a bare metal # 21 of an unknown color and the box art a camouflaged Blue 30. Also included on the sheet are a Finnish AF version and one for the unified Germany Luftwaffe. The decals are very matte and have large clear carrier film. This is so typical of the 'early years' of most model companies; in this case the plethora of Easter European and Russian model companies that have sprung onto the market in the last 15 years. It is not an 'unbuildable' or even poor kit, just one that has not yet reached the top level. I'd not doubt that this will make into a very nice model that the majority of modelers will be pleased to have on their shelves. Thanks to me for providing this kit.